How common is clubfoot? | Podiatry Associates, P.C. 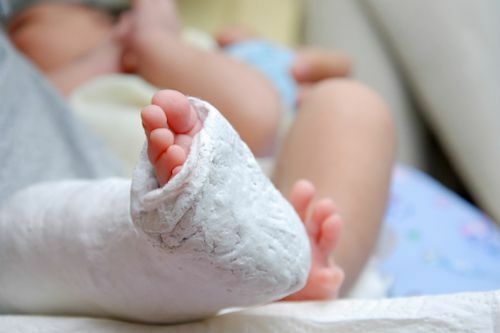 Clubfoot is one of the most common birth defects in children. In fact, about 1 out of every 1,000 babies born in the US every year is diagnosed with it. With just under four million babies born in our nation annually, that’s quite a lot of children with clubfoot each year! While it’s unfortunate that so many children have this birth defect, the number should encourage parents facing the treatment process with their little one, they remind you that you are far from alone in this. Many, many families have successfully dealt with clubbed feet. Our team at Podiatry Associates, P.C. has seen and treated our own share of those children in our offices. The key is to seek professional care from a foot and ankle expert shortly after your child is born so you can begin planning out treatment and the recovery process. Our experts at Podiatry Associates will evaluate the severity of your child’s condition and help you understand the methods available to you for treatment. Make an appointment with us through our website to take care of your child’s feet today. You can also call our Parker, Cherry Creek, and Castle Pines, CO, locations at (303) 805-5156.